More good news for Gov. Chris Sununu as the newest Morning Consult polling finds he’s the fourth most popular governor in America, with a net approval of +39 (61 percent approve, 22 percent disapprove). Not only is he leading the national pack, but Sununu also enjoys a net favorability over the New Hampshire (all Democrat) congressional delegation of +17. “Humbled and very appreciative that Republicans, Democrats, and Undeclared voters support our work for a better New Hampshire,” Gov. 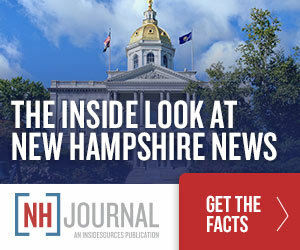 Sununu told NHJournal. For a Republican governor of a purple state that Hillary Clinton won in 2016, those are very good numbers–though not as impressive as south of the border where Massachusetts Gov. Charlie Baker continues to lead the national pack (69 percent approve, 17 percent disapprove). In fact, all 10 of the most popular governors in the US are Republicans, and four of them are governors of blue or purple states (MA, MD, NH, NV). Unemployment down to 2.7 percent, the third lowest rate in the US. The state’s business climate ranking has moved up significantly, according to CEO Magazine. The fifth safest state in the U.S. Meanwhile, the two Democrats running in the gubernatorial primary are turning their guns on each other, largely over social issues like abortion and public financing of campaigns. Gov. Sununu’s slogan: “We’re all about the economy–and it’s working,” appears to be doing the job.